Israel Launches Spacecraft To The Moon If the mission is successful, it would make Israel the fourth country to land on the lunar surface – after the U.S., the former Soviet Union and China. 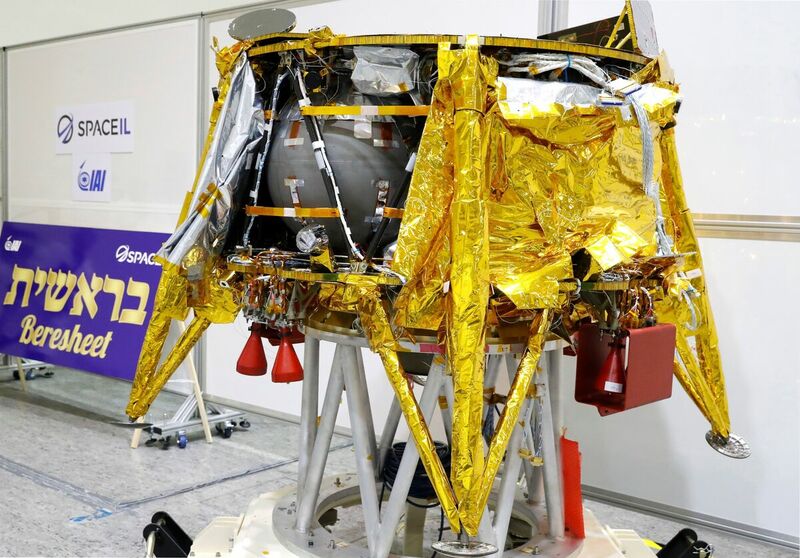 The Israeli nonprofit SpaceIL displayed the spacecraft in December in Yehud, east of Tel Aviv, and added a time capsule for it to carry to the moon. It would also be the first privately initiated project to do so, although it was assisted by government partners, as Nature notes. "The feat seems set to kick off a new era of lunar exploration – one in which national space agencies work alongside private industries to investigate and exploit the moon and its resources," Nature added. The spacecraft, which is called Beresheet (Hebrew for "in the beginning"), was launched from Cape Canaveral, Fla. It was initially conceived as part of Google's challenge called the Google Lunar XPRIZE for a private company to complete a soft landing on the moon. The Israeli non-profit SpaceIL was one of five international teams in the running for the $20 million grand prize; Google announced last year that the contest would end with no winner because no team was prepared to launch by the deadline. Still, the Israeli engineers at SpaceIL continued to work toward landing a spacecraft on the moon. The spacecraft launched with a Space X Falcon 9 rocket, according to SpaceIL's partner Israel Aerospace Industries. It detached from the reusable rocket, which returned to an off-shore platform. The spacecraft was to make several orbits around Earth, slowly getting closer to the moon. In a difficult maneuver, it was to pivot from orbiting Earth to orbiting the moon, and then eventually attempt a treacherous landing on the moon. "For many months, our teams and IAI's were engaged in testing the spacecraft and its systems, conducting complex experiments and preparing for every possible scenario of the mission, whose success will make Israel an extremely proud nation," Ido Antebi, the CEO of SpaceIL, said in a statement. The total journey will take about two months, with a landing anticipated in mid-April. According to IAI, it would be the "longest journey until landing on the moon, 6.5 million kilometers." Beresheet is covered in gold-colored reflective coating. And as WMFE's Brendan Byrne reported, it's about the size of a kitchen table. "The countries that have done this before — China, Russia and the United States — have done it with a budget of billions of dollars," SpaceIL adviser Dafna Jackson told Byrne. "We didn't have that budget. We are on a budget of $100 million." It's carrying a digital time capsule which, according to The Jerusalem Post, contains "drawings by Israeli children, the Bible, the national anthem, prayers, Israeli songs and a map of the State of Israel, among other cultural items." The spacecraft is set to run experiments on the moon's surface – in particular, SpaceIL says it will collaborate with the Weizmann Institute of Science and UCLA to "take measurements of the Moon's mysterious magnetic field." SpaceIL has said that it wants to spark an Israeli "Apollo Effect," a reference to the successful U.S. space program. And, it may also have the effect of inspiring government programs. As the BBC notes, "Both the US and European space agencies have stated their intention to use commercial landers to deliver some of their scientific payloads to the Moon."